Activision announced that the original Spyro trilogy will be getting a remaster for Xbox One and PlayStation 4 earlier today. But could they be coming to another console soon? The Spyro the Dragon, Spyro 2: Ripto's Rage, and Spyro: Year of the Dragon remasters will arrive on Sept. 21 and will be packaged into a singular title called Spyro Reignited Trilogy. Each game will be getting a complete HD overhaul with impressive new graphics, textures, and more. Nintendo Switch players were left in the dark after the announcement, however, with no signs of the game coming to Switch, PC, or any other console—that is until a new listing on Nintendo U.K.'s website seemed to confirm that the game was coming to the system. That listing has now been taken down, but not before we could get a screengrab of it. The listing didn't give a date for when the title will potentially come out on the system, with only the price of the game and a description of each title available. At this time, Activision has not announced any plans for the game to come to any systems other than the PlayStation 4 and Xbox One. 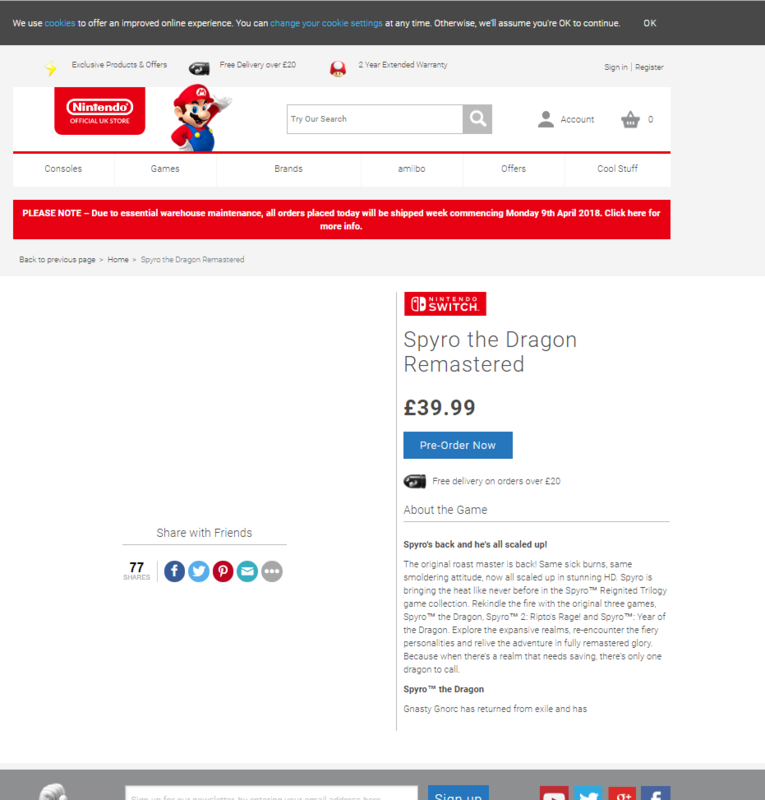 While this news would usually be taken with a pinch of salt, the fact that the official Nintendo store was offering players the chance to preorder the game is a promising sign for fans of Spyro who own a Nintendo Switch system.